When ever one or more of the properties of a system change, a change in the state of the system occurs. The path of the succession of states through which the system passes is called the thermodynamic process . One example of a thermodynamic process is increasing the temperature of a fluid while maintaining a constant pressure. Another example is increasing the pressure of a confined gas while maintaining a constant temperature. 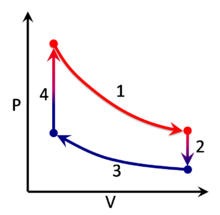 A thermodynamic process can be visualized by graphically plotting the changes to the system's state variables . In the example, four processes are shown. Each process has a well-defined start and end point in the pressure-volume state space . In this particular example, processes 1 and 3 are isothermal , whereas processes 2 and 4 are isochoric . The PV diagram is a particularly useful visualization of a process, because the area under the curve of a process is the amount of work done by the system during that process. Thus work is considered to be a process variable , as its exact value depends on the particular path taken between the start and end points of the process. Similarly, heat may be transferred during a process, and it too is a process variable. In contrast, pressure and volume (as well as numerous other properties ) are considered state variables because their values depend only on the position of the start and end points, not the particular path between them.